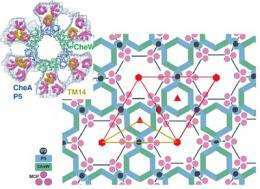 (PhysOrg.com) -- Cornell researchers have peered into the complex molecular network of receptors that give one-celled organisms like bacteria the ability to sense their environment and respond to chemical changes as small as 1 part in 1,000. Has anyone read the PNAS paper? Do they have any thoughts about how this arrangement increases the sensitivity? Haha, must be the tea, daddy-O, I don't feel so square anymore.